But how many students of your students actually do the reading? Can you tell? And if students are going to come to class and hear you speak and lecture on the same material, why should they read it ahead of time? Most college students are busy with jobs, other classes, and yes, a social life. It is part of college. How many of us maybe skipped a reading or two (or more?!) in the course of our college lives if we’re honest? While it is true that faculty have always assigned textbook and other homework, one of the new elements that changes this paradigm is technology. There are now newer – and often free – ways to get across content information ahead of class that can lead to more engagement inside the classroom. I’ve talked before about whose responsibility it is to engage students on my own blog. I believe that it is partly my job to find ways to have students want to engage in the material. In my upper level art history classes, I have found all kinds of ways to increase student engagement. But the art history survey was proving a very hard nut to crack. That changed in the Fall of 2014, when, coming off of a sabbatical, I realized I could harness the power of online education for the student work ahead of coming to class and then do something to really engage students with the works of art that so energize me as an art historian, and as a human being, in the classroom. In essence, I realized, I could flip the survey. I used the Khan Academy Art History videos that were first created by Drs. Beth Harris and Steve Zucker, but have been added to by many other fine scholars and teachers over the years. For the flipped art history survey, students watched these videos and then came to class to engage in the ideas of the period in question. I usually assigned about six to seven videos or texts from Khan Academy ahead of time. I make all links available in our class’ Blackboard shell. A quiz was given at the start of class in the form of an annotated image that students sometimes filled out individually or in pairs. This is one example of the quiz on the Woman of Willendorf. After the quizzes, we engaged in deeper discussion of the period in question. For instance, during the prehistoric unit, I included a case study in which hunter-gatherers faced specific threats and difficulties as they decided whether or not to transition to farming, a scenario based on a Reacting to the Past game by my colleague Paula K. Lazrus. This is the key to teaching in this manner: use the technology but make sure class time is devoted to deep immersion in the ideas and themes of the works of art and cultures themselves. And, truthfully, at times this was a daunting task. In fact, the most difficult part of the flipped pedagogy is not lecturing on the material. If you do, you lose the integrity of why you assigned the videos and readings in the first place. To illustrate, one of my favorite experiments in this course focused on the art of the Minoans. Upon coming to class, I split them into teams of “archaeologists.” I created a website entitled “Mystery Culture,” being sure not to refer to them as the Minoans per se. Based on this student feedback, and other similar comments from student evaluations, I will always teach art history with this flipped model. Students were much more engaged with the material even from the very beginning of the semester, asking many more questions than in the past. One assessment of this experiment was week three, when I realized that I knew all twenty of my students not just superficially, but individually. This is because they had all spoken, asked questions, or otherwise made their individuality known. In my experience, this rarely happens in a lecture class, where I consistently engage with maybe five or six of the overall twenty to twenty-five students in the course. In addition to this personal assessment, these students did just as well on exams as students in the more traditional lecture-based classes. The keys are these: keep them accountable with some kind of quiz on at least one of the several images assigned; keep them engaged in class with an activity, case study, debate or Reacting to the Past game that focuses on the issues related to the art of the period; and never, ever lecture on the assigned material unless your assessments demonstrate that they missed something significant or have misunderstandings. Great #PLN and thanks for sharing your thoughts. Thank you @ManelTrenchs – I appreciate the comment – and am now following you on Twitter! Thank you SO MUCH for this. I am a new art history adjunct teaching 101 at a community college and am having the hardest time reconciling the fact that they “read” the textbook information and then I just tell them the same information again in class (let alone not having enough time to teach it “all” anyway). I have been struggling a lot this semester with this concept. I have tried implementing small activities in class in order to break up lecture and to give them an authentic learning experience that doesn’t revolve around the textbook (because why even assign the material for them to read if I’m just going to cover it in class? ), but it hasn’t really been working the way I’ve tried it and I’ve just gotten frustrated. This sounds like a wonderful solution–don’t teach the assigned material at all..?! 1. Rather specific, but for your Minoan activity, did you not assign any reading/viewing before class so that the entire culture itself was a surprise? How did that work? What if a student does decide to read ahead, etc.? Or did you emphasize that they couldn’t bring any prior knowledge into the activity even if they did know what culture you were discussing? 2. 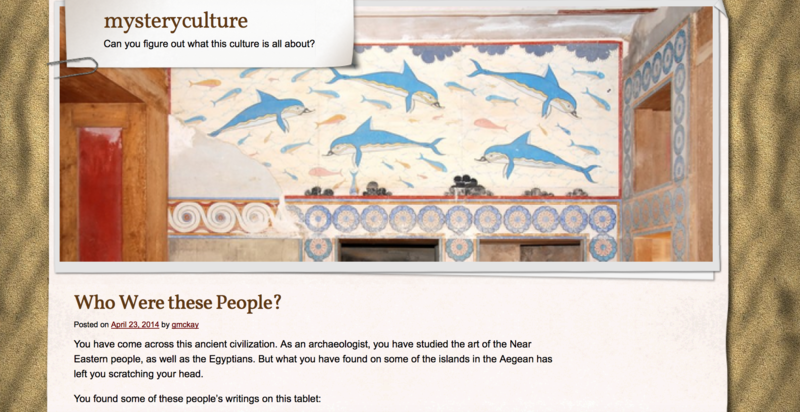 Do you have activities like the Minoan culture activity for ALL your classes? If/when you do, what exactly do you “lecture” on? 3. I am required to assign 90% of my course’s reading from the survey textbook, and only 10% can be “outside reading.” Would your version of the flipped model still work in my scenario? Are the videos/reading significantly less than a textbook chapter? 4. I know this is personal/extremely varied from one instructor to another, but how exactly do you test your students on the material, especially if you don’t cover the bulk of the material in class? Do you still do Image Identification tests? Or focus on essays where they can show what it is they’ve learned? Or multiple choice questions produced straight from the survey textbook info? I know what the (two) other instructors at my college do, but I am finding that I do not like the way my tests are currently set up. Yikes, I know that is a lot of text, but this website is the one online resource I have found to help me sort through HOW to teach art history. 1. I wasn’t happy with the Minoan content on Khan and wanted to shake things up so for that no, they didn’t do any prep. But I was pushing them pretty hard so one day off did not seem like a cop out – and they worked hard IN class to figure things out. 2. I have different engaging activities for every day, yes, that are NOT lectures. As I say in the post, that is the hardest thing. I can’t put it all down, but I use a combination of discussion of unknowns, debates, Reacting games, and various scenarios to get them looking and thinking. I only lecture when it is clear that they missed something or if there is just not the right content on the web that I can assign (which for me is only with Byzantine art because that is my training and certain things I want to stress others do not). 3. You could do the textbook – you just need quizzes on the images in the reading and NOT lecture on the material assigned. They will quickly realize you aren’t going to feed it to them when they do not do well on a quiz or two. BTW, the quizzes I give are just check-marks. If it seems they are not keeping up, I have a word with them. 4. I have gone away from memorization for a variety of reasons, but mostly because it is lower level learning and thus won’t “stick” much past the exam. I have a variety of assessment methods that I use, but I still have exams but they are most essay. I have never done multiple choice as I feel that is too much a “gotchya” type of questioning. It definitely does, thanks so much for replying. I am checking out your website now! I really enjoyed this post! And it’s good to hear Smarthistory has been useful! We’re sorry you weren’t happy with the Minoan content on Smarthistory at Khan Academy – if you know any folks who are experts in the ancient Aegean, send them our way (as you know we are dependent on contributions from art historians writing in their area of expertise). You may be interested to know that we just published a video on the frescos from Thera – not Minoan, but close! I was immediately suspicious when Khan was mentioned. I’m not sure of its credentials and fear it is just a watered down version of education. I am interested in new and innovative teaching methods especially those that are taught online. If anyone has ideas I would greatly appreciate it. I would like to know more about the reactive games. I like the interactive methods very much though I still think memorization is important for works of art and their creators. I was an art history student myself and I have not forgotten any of the images I memorized for tests. Interesting right? I’m sorry no one has yet answered your concern about Khan Academy here on AHTR or let us know about it, or I would have answered sooner. Smarthistory is responsible for all the art history content on khanacademy.org – and it can also be found at smarthistory.org. When you read the link above, you’ll see that Smarthistory was founded by two art historians with decades of teaching experience and that the content is ours, or has been developed by 200+ very generous art historians writing in their area of expertise. For those interested in flipping the classroom, you might want to take a look at two previous posts about experiences flipping the classroom. The second one, posted by me, also discusses the use of Khan Academy/Smarthistory videos.